SPM-2100T Series Tactical Body PTT. PRYME remote speaker microphones are the first choice for anyone who wants simple communications, including many public safety and private security officers. The Trooper SPM-2100 Series is a heavy-duty speaker microphone with a high impact resistant, rubber sealed housing. 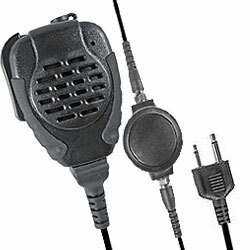 The speaker microphone head has a large PTT button that is easy to activate with gloves on. Every aspect of the Trooper features heavy-duty construction practices. Polyurethane jacketed microphone cable with ample strain relief and an impact resistant, rubber sealed, polycarbonate housing, prepare the Trooper for a long product lifespan, of heavy-duty use, in wet environments. The Trooper has a large Push-To-Talk switch, on the side speaker microphone, that extends over the top and can be easily activated while wearing gloves. The Trooper has a spring loaded metal reinforced clothing clip that can rotate a full 360 allowing the user to wear the Trooper securely with most types of uniforms. The Trooper has a high quality electret condenser-style microphone element that transmits clearly. The Trooper also has a powerful speaker that provides ample sound. For added privacy, the Trooper also has and a 3.5mm earphone jack that allows the user to privately listen to their radio, and provides a clean and professional look. Heavy-duty construction, featuring polyurethane cables and impact-resistant polycarbonate housing. Features a 3.5mm accessory jack for connecting an earphone to the unit. HYDRA® (Patent Pending) Radio Connectors are available only on select radio connector models and are molded to provide the very best resistance to elements. Because the wires and electronic components inside of the connector are sealed beneath the hardened thermoplastic shell, the connector is completely waterproof and can be fully immersed. RINO® Super Rugged Cables are the most durable microphone cable ever. The new RINO® cable is a rugged, military-grade cable that is engineered to last longer and retain its original shape better than Pryme's previous cable. With a tough polymer jacket on the outside and Kevlar® reinforcement inside, this cable extends the lifespan of Pryme audio accessories.